Dietary fiber is the part of plants that cannot be digested by our bodies. There are two types of fiber: soluble and insoluble. Getting enough fiber throughout the day in your diet can help you to manage your blood sugar levels and improve your overall health. Soluble fiber sources: oats, oats bran, linseeds, barley, fruits and vegetables, nuts, beans, pulses, soya and lentils. Insoluble fiber sources: wholegrain cereals, bran, nuts, seeds and the skin of some fruits and vegetables. 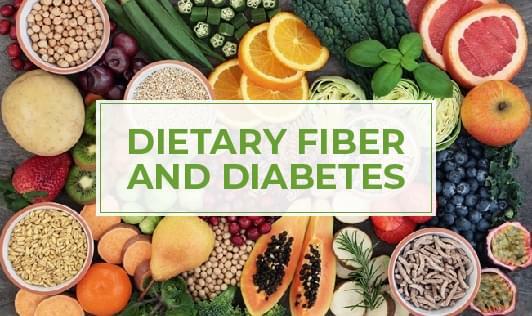 How does soluble fiber help diabetics? Soluble fiber attracts water and turns into a gel-like substance that slows down digestion and helps diabetics improve their blood sugar levels by preventing blood sugar spikes after meals. Fiber slows the release of glucose into the bloodstream. Fiber signals the liver to manufacture less glucose. Fiber makes you feel fuller so it’s easier to eat less. Fiber alters the gut microbiome in a way that makes the bacteria to consume more calories from the food that you eat. Dietary Fiber makes it easier to maintain a healthy weight. How to get more fiber from your diet? Adding these high fiber foods to your diet is an easy hassle-free way to increase your fiber intake and reap the health benefits! It is essential to increase your fiber intake slowly because by suddenly increasing high fiber intake can cause gas and bloating. When increasing fiber in your diet, be sure to drink 10-12 glasses of water per day to avoid constipation.